Melissa Farmer, University of Illinois Urbana-Champaign School of Social Work. She is completing her internship at the United Way of Chicago. During this time she intends to learn more about community services for seniors as well as to advocate for and evaluate programs. Her BSW internship was at Senior Services of Will County in Joliet. Upon completion of her BSW she continued on as a Case Manager at Senior Services. Since entering the MSW program she has worked closely with Dr. Chi-Fang Wu researching governmental assistance and the relationship between poverty and health. Throughout her undergraduate and graduate studies she has consistently devoted herself to understanding the issues confronted by the elderly. This has led her to develop skills in advocacy, program planning, and program evaluation. Melissa was adopted by an older couple as a child. Her commitment to serving the elderly population as a form of "giving back". Some of her volunteer work was done thorough her undergraduate program, Lewis University where she completed her Bachelors of Arts in Social Work in 2013. This included experience on the "LUMINATE May Service" trip where she worked with the Omaha Tribe in Nebraska. This experience was similar to an alternative Spring Break experience, but more in depth for several weeks in May. She has done other faith based and secular volunteer work. 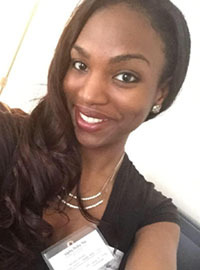 At Lewis University she was both a Peer Counselor as well as a Peer Minister. During her time in the MSW program she has worked diligently to go above and beyond the normal requirements. She has completed training in "Mental Health First Aid" (Mental Health Association) and as a "Comprehensive Care Coordinator" (Illinois Department of Aging). These skills will enhance the advocacy, leadership and research skills from her concentration area.